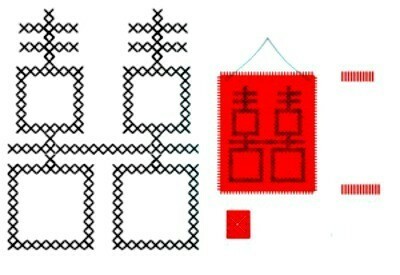 This is a modern version of the Chinese "Double Happiness" icon. It is considered good luck to display it in your home. It makes a nice Christmas ornament when cross stitched with black thread onto red 11 gauge material. Count four squares for each stitch. You can add your own straight or decorative border. Use fabric glue to glue onto plain red or black material of the same gauge.